Tea is savoury anti-oxidant rich drink that offers numerous health benefits. Its effect on the human cardiovascular system is exemplary. According to recent research manifestations, the flavonoids present in tea helps to improve blood vessel and endothelial functions, by regularizing cholesterol levels. However, the quality of tea being consumed matters a lot. Also, once you have identified a suitable brand, the question that pops up is - What to brew with? Let’s explore the best loose-leaf makers available in the market. 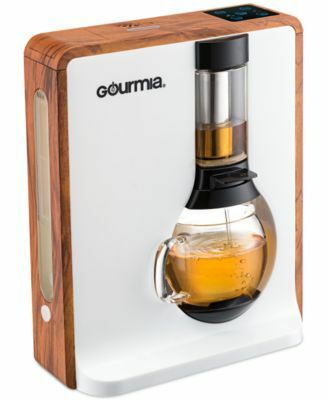 Gourmia’s GTC8000W Electric Square Coffee & Tea Maker is an easy-to-use device that oozes a modernistic appeal. The intricate detailing of its structure provides an elegant touch. The machine also comes with a safety feature, that prevents it from functioning when the carafe is detached. The unit offers 3 types of brewing options- light medium and strong, with an implemented boil-to-brew technology. It’s formulated specifically for culinary enthusiasts who prefer quality over quantity, because the Gourmia tea maker falls short in the volume department. Rendering bistro quality flavours, it also brews coffee, as confirmed by All About Tea. It brews perfectly balanced loose-leaf teas with one touch, automatic feature. Comes with Backlit LED touch sensor panel and safety warning. Offers 4 types of strength settings- light, medium, and strong, plus a refresh cycle to prep and hydrate your tea before brewing. Made of extra-fine stainless-steel strainer. Includes 4 cup sparkling glass carafe and a brew chamber that ensures purity of flavour. Implemented with exclusive “iTEA” Boil-To-Brew technology. Glass and stainless-steel brew chamber and carafe, to ensure purity. Also brews coffee, offering three different strengths choices. A unique and sophisticated product, the Teavana Perfect Tea Maker is made from Tritan polycarbonate, a special plastic material that resonates a glowing and transparent look. Its infuser also has the capacity to produce a significant quantity of tea at a time. The four-piece construction can be easily removed and reassembled for cleaning. Also, it is BPA free, an added input in the health department. According to WhatKettle, the only detrimental feature would be its plastic build, that may get scratched easily and makes it unsafe to put it in a dishwasher. Easy cleaning and maintenance, with patented drain mechanism. Offers an efficient and simple way to steep tea. The plastic handle prevents heat burn while handling. It’s portable and lightweight, doesn’t take up space. Affordable pricing when compared to other variants. Kati Steeping Cup & Infuser Lotus is a 12-ounce streamlined ceramic tumbler that comes with a lid and stainless-steel infuser. The double-wall construction keeps the tea warm and brews 12 oz of tea at a time. The lid and cup are also microwave and dishwasher safe. The Kati Steeping cup scores big in the aesthetics department with a beautiful and elegant design. The soothing colour palette is also extremely pleasing to the eye. The stainless-steel infuser is easy to clean, and stains residue perfectly. Its insulated double wall ceramic design offers easy handling. Steeps up to 12 oz of tea. Tea is a personal beverage, a champion among the various types of refreshments available in the market. Everyone will have a different opinion about the perfect cup, but one thing is universal- the longer you brew, the more goodness it echoes. The health benefits of tea are linked with 3 main bioactive compounds (non-essential nutrients that impact human health), namely Caffeine, Catechins and L-theanine. A generous source of micronutrients like magnesium, fluoride and zinc, tea can be masterminded with the right tea maker. We have compiled this list as a testament to the most famous non-alcoholic drink in the world. It’s time to take a hot sip. Cheers!